HOW MANY PEOPLE HAVE BEEN DIAGNOSED WITH CANCER WHERE YOU LIVE? MORE than 100,900 people across Northern Ireland were diagnosed with cancer between 2001 and 2010 and 38,139 people died from the disease. The Northern Ireland Cancer Registry based at Queen’s University in Belfast has confirmed that the number of cancer cases diagnosed here has risen from 8,400 in 1993 to 11,300 in 2010 – a 34% increase which is due largely to population growth and ageing. The Detail has been given access to the most recent detailed data on cancer diagnosis and deaths held by the registry – which maintains and operates a register of cancer diagnoses in Northern Ireland. This covers the period 2001 – 2010. We requested cancer diagnosis and death figures for each postcode district in Northern Ireland including a breakdown of the statistics for the five main cancer types – colorectal, lung, breast (female only), prostate and non-melanoma skin cancer. We have used the figures to compile an interactive Northern Ireland Cancer Map (above) which enables readers to click on their postcode district to see the specific figures relating to their area. We have also created a table which ranks our 80 postcode districts by the number of main cancers and total cancers diagnosed. The Cancer Registry also provided a breakdown by electoral ward but we focused on postcode areas for our analysis. The full data is available below this article. While lifestyle factors play a major role, research has already shown that where you live can make a difference to cancer diagnosis rates. The NI Cancer Registry previously teamed up with the cancer registry in the Republic of Ireland to map the geographical distribution of the 18 commonest cancers diagnosed between 1995 and 2007. Key findings of this research include higher cancer risk around Dublin, Cork, Waterford, Belfast and Sligo for cervical cancer; in a band running from Dublin to Donegal, excluding the north-east, but including Belfast for stomach cancer and in the urban areas of Belfast, Dublin, Derry and Cork, and in Louth, Kildare, Carlow and Wicklow for lung cancer. People living in more densely populated areas had a higher risk of cancer than those living in more sparsely populated areas. Lung cancer, female lymphoma, cancer of the uterus and female head and neck cancer are more common in Northern Ireland than the Republic of Ireland. Skin cancer, prostate cancer, bladder cancer, leukaemia, pancreatic cancer, brain cancer and cervical cancer are all higher in the Republic of Ireland. There is no difference for breast cancer and colorectal cancer. The researchers also found many cancers showed a relationship to employment and/or educational attainment. The risk of lung, stomach, head and neck and cervical cancer risk was higher in areas of high unemployment and/or low educational attainment. The risk of cancers of the skin, female breast and prostate was lower in areas of high unemployment and/or high educational attainment. In most cases, increasing population density and a high proportion of elderly living alone were associated with increased cancer risk, irrespective of deprivation. 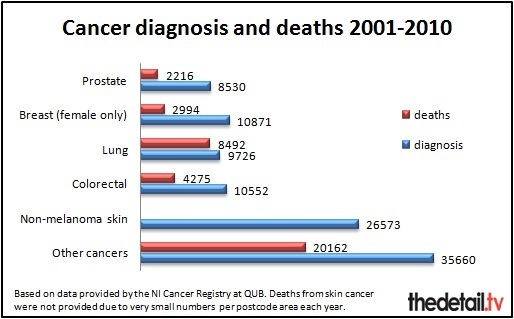 The figures we requested from the NI Cancer Registry relate to cancers diagnosed and deaths which occurred between 2001 and 2010 broken down by postcode district of residence. A total of 101,912 people received a cancer diagnosis between 2001 and 2010. There were 38,139 deaths from cancer. Over a quarter (26%) of the cancers diagnosed were non-melanoma skin cancer – 26,573 cases. However, this is an easily treated cancer so despite there being over 3,000 cases diagnosed per year the NI Cancer Registry said there are only between 10 and 20 deaths from the disease annually. A per postcode area breakdown was not provided for deaths from this cancer type as the numbers are so small. The registry said that ultraviolet radiation is a major cause of skin cancer and urged people to take care in the sun and avoid sun beds. The main cancer type resulting in the most deaths over the 10 year period was lung cancer with 8,492 people in Northern Ireland dying from this illness – 22% of the total deaths during this time period. The registry said that smoking was a major cause of “this largely preventable cancer”. The postcode district with the most lung cancer deaths was BT5 where 307 people died. This covers areas in Belfast, Castlereagh, Crossnacreevy, Gilnahirk and Knock. The postcode district with the largest number of ‘all cancer’ deaths was BT34 – which covers Newry, Annalong, Ballymartin, Cabra, Hilltown, Kilcoo, Kilkeel, Mayobridge, Poyntzpass, Rathfriland, Rostrevor, Warrenpoint, Newry and Mourne. Here 1,150 people died from cancer between 2001 and 2010 – compared to less than five deaths in the less densely populated Titanic Quarter/docks area of BT3 in Belfast. A total of 3,193 cancers were diagnosed in BT34 over the 10 years – compared to just five cases in BT3. BT5 was ranked second for the number of deaths from cancer with a total of 1,149 deaths of people resident in this area – which covers Belfast, Castlereagh, Crossnacreevy, Gilnahirk and Knock. BT64 (Craigavon, Knockmenagh, Mandevill) only had six cancer deaths. We looked in detail at the number of diagnoses for people living in each postcode district for the five most common cancers – colorectal, lung, breast (female only), prostate and non-melanoma skin cancer – and the total ‘all cancer’ cases. We ranked each postcode from 1 to 80 with 1 relating to the highest number of people diagnosed and 80 the lowest. Three postcode districts were ranked first, second or third of all postcode areas for colorectal, breast (female only) and prostate cancers. These were BT23 (which covers the areas of Newtownards, Ballygowan, Comber, Conlig, Killinchy, Moneyrea and Ards), BT34 (Newry, Annalong, Ballymartin, Cabra, Hilltown, Kilcoo, Kilkeel, Mayobridge, Poyntzpass, Rathfriland, Rostrevor, Warrenpoint, Newry and Mourne) and BT47 (Derry, Waterside, Claudy, Feeny, Dungiven, Eglinton, Park, New Buildings). These areas were also ranked in the top three for the total number of all cancers diagnosed in each area. If you click here you can examine the rankings for all of the postcode districts for all of the main cancers and total cancers diagnosed. Red in this table signifies a postcode district being in the top third for number of cases diagnosed, yellow is the code for the middle third and green signifies a district in the lowest third and therefore the lowest number of cases. Some postcode districts have a similar ranking for all of the cancer types – for example BT29 is ranked between 66th and 69th right across the board. This covers areas of Belfast, Crumlin, Aldergrove, Dundrod, Glenavy, Nutts Corner and County Antrim. In other areas, there are marked differences in ranking between cancer types. For example, BT13 covers areas in Belfast, Shankill Road, Woodvale, Ballygomartin, Springmartin, Glencairn and Highfield. It was ranked third for lung cancer with 327 cases diagnosed from 2001 to 2010 but was 42nd for non-melanoma skin cancer diagnosis. And BT78 (Omagh, Dromore, Drumquin, Eskra, Fintona, Killynure, Newtownstewart, Seskanore, Trillick) is ranked in the top third (18th) for prostate cancer, compared to 43rd place for female breast cancer. The Northern Ireland Cancer Registry was established in May 1994 and is located in the Centre for Public Health at Queen’s University in Belfast. It is funded by the Public Health Agency. After analysing the data provided, we submitted a number of questions to the registry and a detailed response was given. The registry stressed that the difference between the number of people diagnosed with cancer and the number of people dying from the disease means that there are a considerable number of people here living with a diagnosis of cancer. A spokesperson also said that the variation in the number of cancers in each postcode district is related to the number of people resident in each area and their age. “To examine if areas are at a higher risk of cancer, age adjusted rates would need to be calculated. We asked if living near the coast made a difference to cancer diagnosis rates. And is it more likely to occur in urban rather than rural areas? However, the registry stressed that it is lifestyle rather than where you live which most affects cancer patterns in Northern Ireland. “Tobacco related cancers account for over one third of cancer deaths. They include lung, oesophagus, stomach, throat, head and neck, pancreas, bladder, kidney and cervical cancers. “Another one third of cancer deaths are linked to diet. Protective factors against cancer include a diet with lots of fruit and vegetables, less meat and less fat. 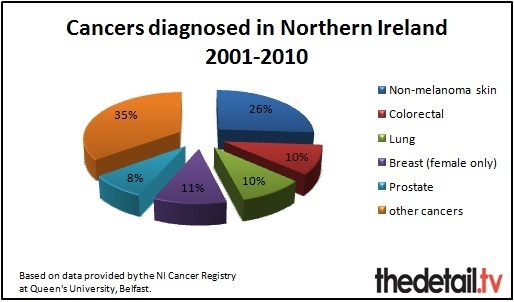 Finally, we asked if any “cancer clusters” had been identified in Northern Ireland. •	Higher colorectal cancer incidence in Ballymoney, Down and Derry. •	Higher prostate cancer in Dungannon, Larne and Moyle. •	Higher breast cancer in Newry & Mourne. Survival rates have improved for many cancers over the last 15 years. For example, the registry said that breast cancer survival has increased from 75% after five years in the mid 1990s to 87% after five years in the late 2000s. However not all cancers have seen an improvement, with lung cancer and ovarian cancer showing very little improvement in long term prognosis. Cancer patients living in Northern Ireland who need radiotherapy treatment currently have to travel to Belfast for the only radiotherapy provision available. The Cancer Centre at Belfast City hospital was designed to provide sufficient radiotherapy capacity for Northern Ireland up to 2015. The construction of the new Altnagelvin Unit centre in Derry is due to be completed by 2015 with the facility available to patients from early 2016. There are five cancer units in Northern Ireland based at Antrim Area Hospital, Altnagelvin Hospital, Craigavon Hospital, Ulster Hospital and the Belfast Trust (between Belfast City and Royal Victoria Hospital). Chemotherapy is offered at all of these units. We requested figures from the Department of Health relating to department spending on cancer screening, treatment and drugs and any impact recent budget cuts have had. As well as detailed figures, a department spokeswoman also sent us a comment. She said: “Spending on cancer drugs in Northern Ireland has virtually doubled over the past five years. 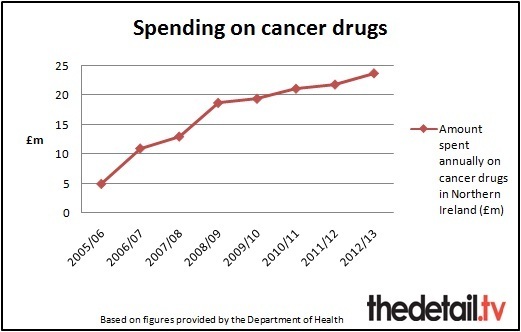 In the past five years (2006/07–2010/11) additional funding of around £11m has been invested in cancer drugs. Northern Ireland spends around £22m annually on cancer drugs. “The Minister recently secured £5m additional funding for specialist drugs and technologies. £1.1m of that funding went towards introducing NICE guidance, which enabled us to fund new cancer drugs for lung cancer, leukaemia and multiple myeloma in 2011/12. “His priority is to ensure that all patients here are able to access the full range of NICE approved drugs, including cancer drugs. “The latest annual figures (2010-11) for breast screening is £4.2m and cervical screening is £1.4m which were unaffected by budget constraints. We examined detailed figures provided on spending on cancer drugs and screening. Drugs spend has been steadily increasing between 2006/07 and 2010/11 and a total of £17.5m was spent on breast cancer screening and £6.5m on cervical cancer screening during this period. However, the department said it was not possible to provide a breakdown of the total cost of cancer treatment. In response to a written Assembly question, Mr Poots also confirmed in September of this year that 384 people were referred for cancer treatment outside of Northern Ireland from 2008 to September 2012. The Minister said that the Health and Social Care Board had advised that information on the total cost for this was not collected centrally and could only be provided “at disproportionate cost”. While the main cancer types are extensively funded by the Department of Health in relation to screening and treatment, it can be more difficult to obtain support for rare forms of cancer. Additional figures provided by the Department of Health in response to a Freedom of Information request we lodged earlier this year showed that a total of 623 children aged from birth to 14 had a first admission to a Northern Ireland hospital with a cancer-related diagnosis in the last 10 years (2001-2011). Just 25 of these children had Neuroblastoma – a rare and aggressive childhood cancer – and 20 of these children were aged four or under. Four-year-old Oscar Knox from Newtownabbey is one of these children. Oscar recently returned from Philadelphia with his parents Stephen and Leona where he had travelled for specialist medical treatment following a major £250,000 fundraising drive by his family. When the family arrived in America they discovered Oscar had pulmonary hypertension and he was admitted to intensive care. The specialist treatment had to be abandoned as Oscar battled the odds to recover from being critically ill.
Fundraising for Oscar’s treatment continues as his family assess future treatment options. We asked Oscar’s mum Leona for her view on cancer treatment in Northern Ireland and the fundraising drive they embarked on in a bid to secure treatment abroad for Oscar. Leona said: “We count ourselves very lucky to live so close to the Children’s hospital in Belfast. The demands of travelling for treatment are huge and once your child develops a temperature of 38 degrees, you need to drop everything to rush them straight to hospital whether you live in Mallusk or Castlederg. Leona said they knew from the start that Neuroblastoma has a very poor prognosis and is considered a “rare” cancer. But she continued: “It is however the most common solid tumour cancer for kids so surely this should mean it receives adequate funding for research and developing treatments. “We’ve read so many articles about how Leukemia was once a very deadly disease for kids, now survival rates are over 90% simply down to significant funding in this area. Leona said that Neuroblastoma charities are challenging the use of the term ‘rare’ when describing this form of cancer. She said: "I suppose if things are considered rare then no-one feels the need to do much about it or allocate much money to it. “It is difficult to read the damning articles describing how far behind America and Germany our research and treatment options for Neuroblastoma are here, and not get angry. “A new clinical trial which could have offered Oscar the immunotherapy treatment he needed was passed to open in the UK in March 2010, but so far it has failed to do so and we have failed to find out why. “We have had to take a step back a few times, and focus our time on Oscar rather than keep taking appeal-related calls or attending fundraising events. For all we know these could be precious times for us and we don’t want to regret not having spent enough time just simply enjoying life with him and his little sister Izzie." 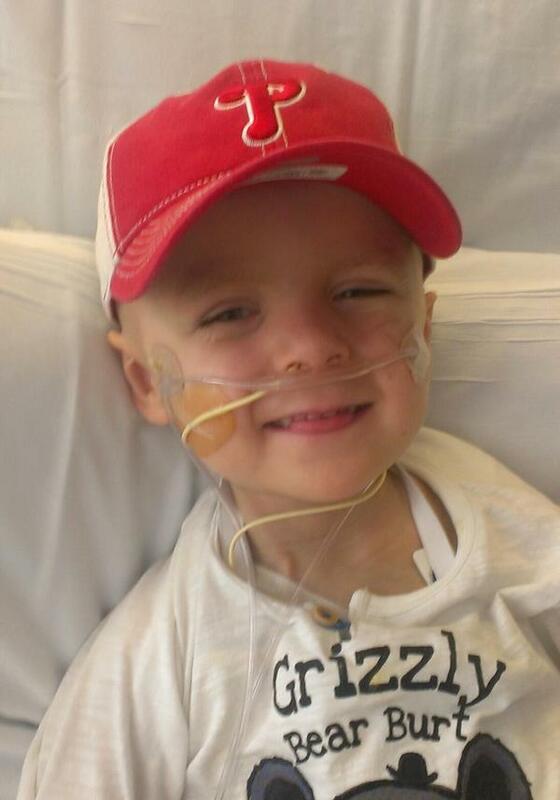 Leona stressed that the family are very happy with the treatment Oscar has received in hospital in Northern Ireland since his Neuroblastoma diagnosis. “The doctors and nurses do an absolutely amazing job in a really tough and emotionally charged environment. We consider some of the staff on our ward as extended family. However, we know their hands are tied. Access to funding, drugs, beds – they make tough decisions every day on what they can do with what is available to them, and we feel the impact of that. “We have always had the outlook that if the NHS can’t give us what we need, we will do whatever it takes to get it elsewhere. “You face plenty of dark days when your child has cancer but we can’t close the door and let our emotions flow and take time to support each other through this. We paint smiles on our faces and step up to the challenge of raising the money we need in the hope of saving our son’s life. We have had an absolutely amazing response from everyone around us. Read more about Oscar’s story here.